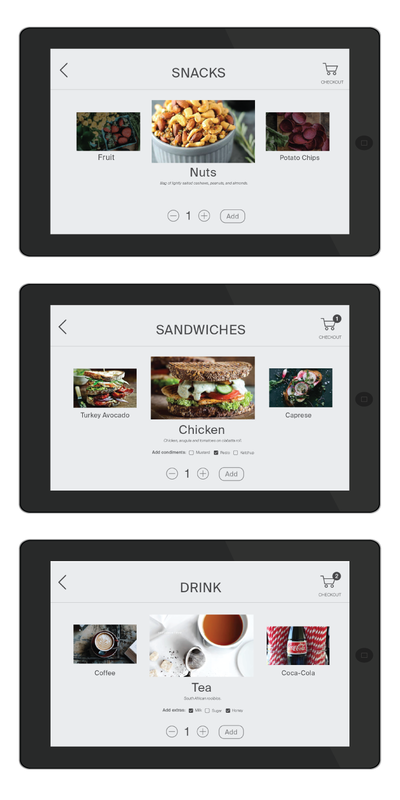 Designing a food ordering app for the airplane. 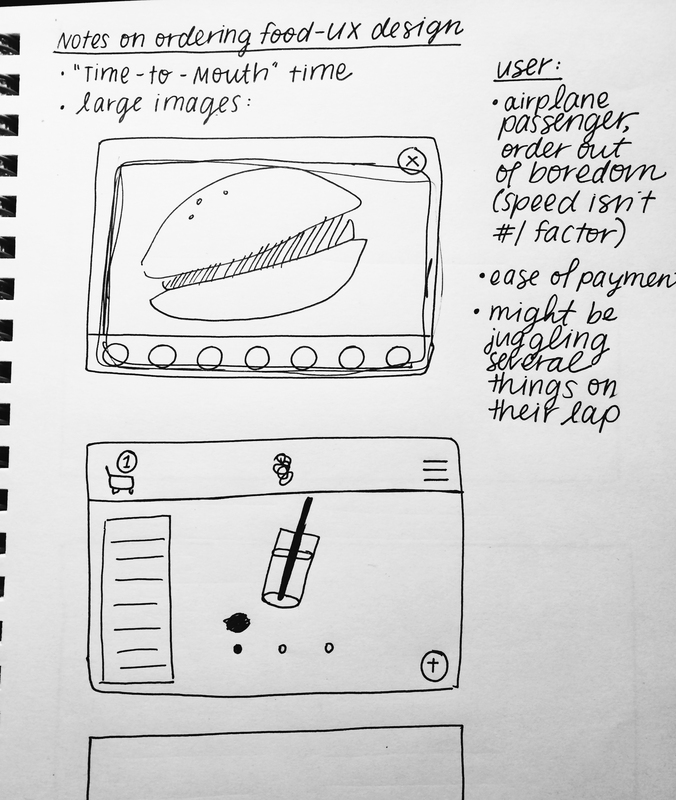 For this week’s assignment, we were challenged to design a seat-back experience for ordering food on a screen. 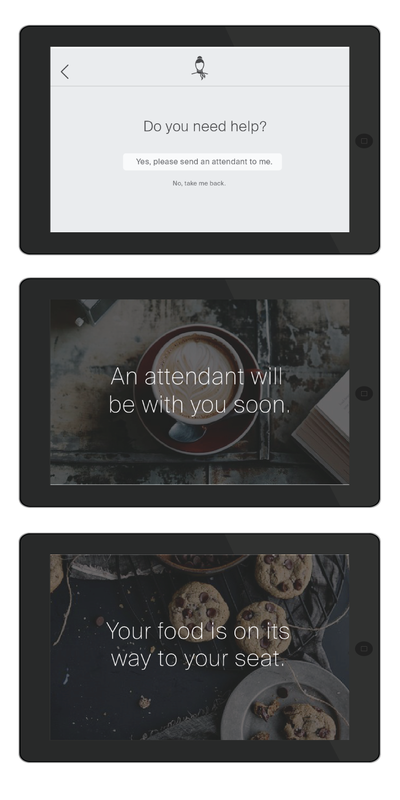 The scenario is as follows: An airline has introduced a new system for ordering and paying for food from the screen behind each seat. There are several different types of food and drink offered, but there are also extras like condiments that can be added to an order. 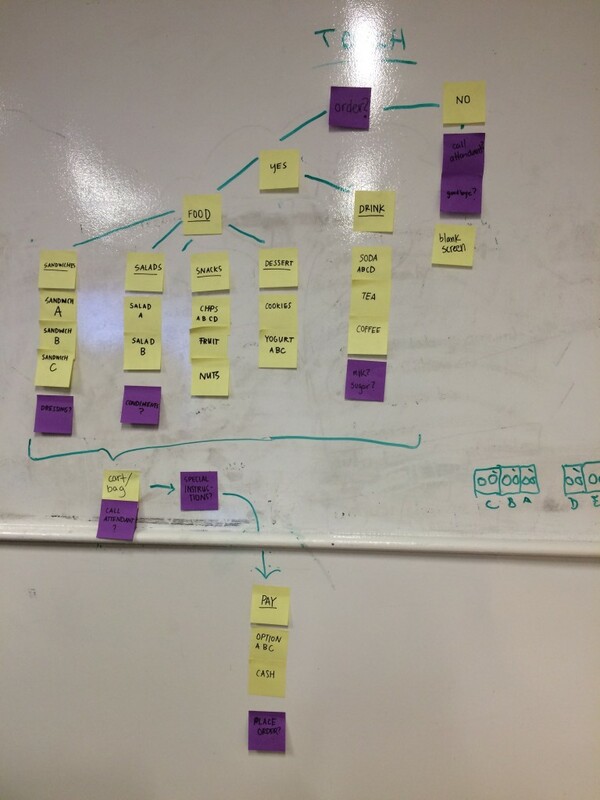 After sitting down with my flow diagram, I started brainstorming some ideas for the wireframes. I thought about the user in this scenario. Everyone flies on airplanes, so the app would need to be accessible to users from a range of ages and backgrounds. Many people are unfamiliar with the iPad app interface altogether and so it would be important to make the experience as intuitive as possible. One method to make the app more intuitive is to make the pictures very large. 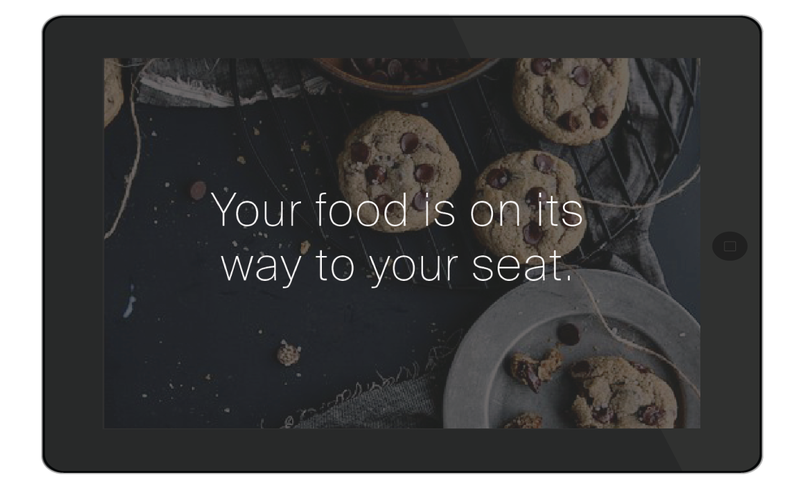 Visual cues help us identify options more quickly, so I decided to overlay the text on large images of the food. First, the user is asked if she would like to order something. If not, then the screen powers down so she won’t be bothered. 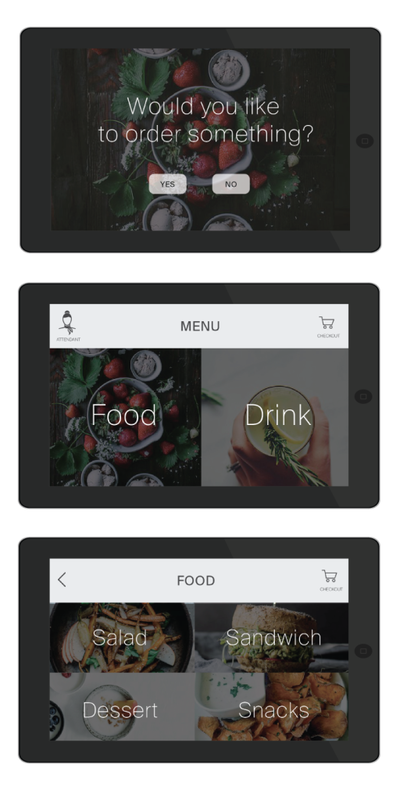 Once the user touches the type of food/drink she would like to order, the available options in that category will appear in a horizontal scroll that you can browse. The user always has the option of going backwards and changing her order. It was important to me that the user was able to add extras like salad dressing or condiments without having to click around. As you can see, she can quickly check the appropriate boxes when she is adding a food item. 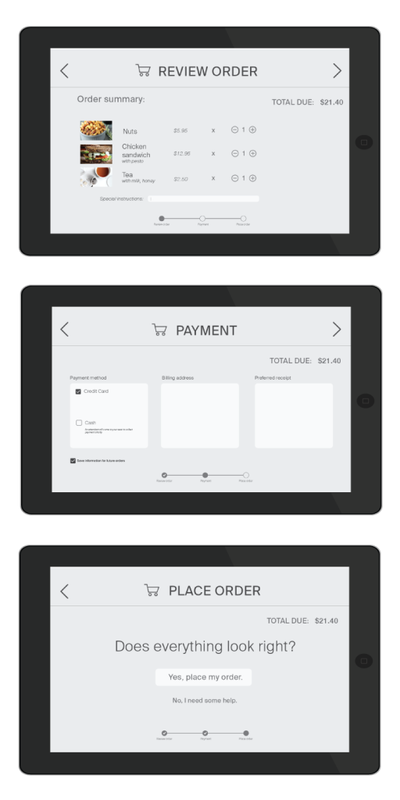 When she is ready to pay, the user clicks the “checkout” cart in the top right-hand corner. The app will guide her through the payment process. There is the option of adding special instructions or paying with either card or cash. If the user is confused and needs help, she is directed to a page to call an attendant. If the order was placed successfully, she’ll receive a completion page. Flying on an airplane is not a pleasant experience. With this design, I aimed to make one aspect of the airline experience a little more comforting, with large images and a simple, minimalist design. 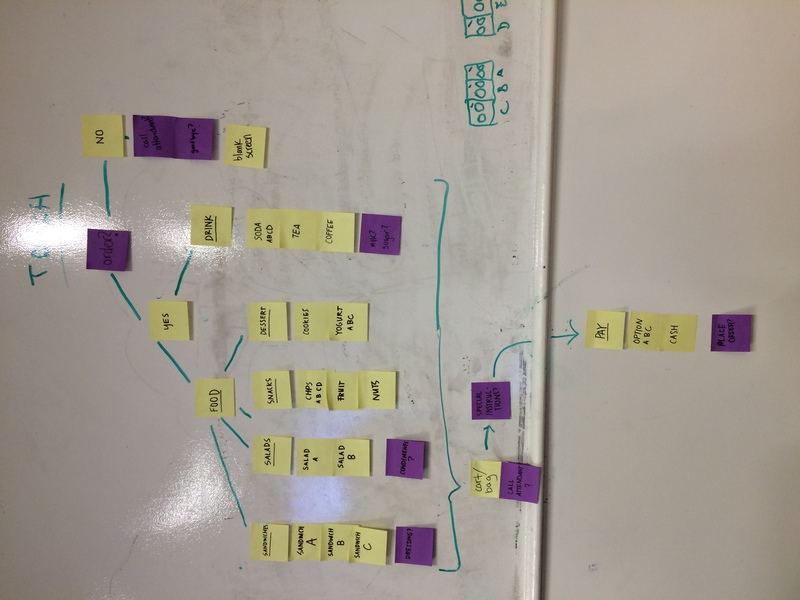 Previous Previous post: Wireframing the goal-tracking app. Next Next post: Generating a composite apology from my email archive.